Leo Haas studied in Karlsruhe and Berlin between 1919 and 1922, influenced by German expressionism and the works of Goya and Lautrec. 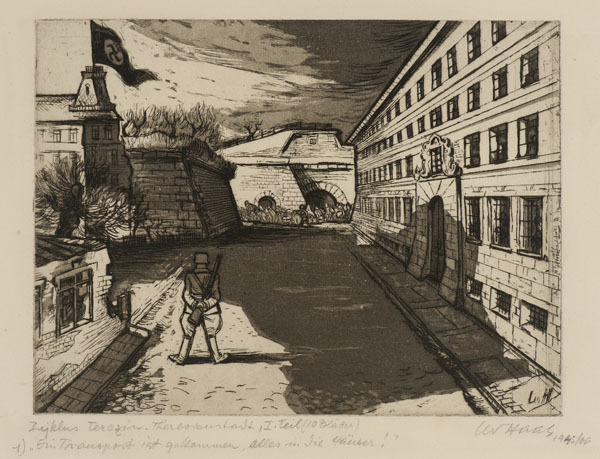 From 1925–38 he worked in Vienna and Opava as an illustrator, painter and book-designer. He was arrested in 1939 for helping German communists to cross the border illegally and sent into forced labour. In September 1942, Haas was deported to the Theresienstadt (Terezin) ghetto, located in the main fortress of the town in northwest Bohemia. In advance of a high profile visit by the International Red Cross in June 1944, the ghetto was to be recreated as a so-called 'model' community housing middle-class Jews, and to be used for propaganda purposes by the Nazis. Noted for its rich cultural life, the ghetto falsely presented a positive impression to the visiting delegation which only saw pleasant surroundings, a children's opera, freshly painted, uncrowded accommodation, and fake cafés and shops. In reality, about a quarter of the mainly Czech Jewish inmates died in the terrible conditions and many others were deported to extermination camps in the East. As an artist, Haas was assigned to the Technical Department to illustrate propaganda material. However, this also enabled him to secretly record the true conditions in the ghetto, creating over 400 drawings inspired by real and terrible events. Following the Red Cross visit, Haas and his fellow artists were accused of smuggling out 'gruesome' art, arrested and tortured. In October 1944 Haas was transported to Auschwitz and a month later to Sachsenhausen, where he was assigned to counterfeiting currency as part of 'Operation Bernhard', a scheme to destabilize the British economy. In February 1945, the counterfeiters were transported to Mathausen and then to Ebensee, where they were finally liberated by the Americans. After the war, Haas returned to Terezín, where he retrieved some 400 of his hidden artworks. Settling in Prague he worked as a newspaper editor and caricaturist, was reunited with his wife and adopted the son of his friend Bedrich Fritta (also an artist imprisoned in Terezin), who had died in Auschwitz. Haas moved to East Berlin in 1955 as a university art professor and also worked in the film industry.